Setting conditions: The parcel on which the house is built must be reached by a road. Special rules: Houses are never bought. They come into play when other buildings are built. Setting conditions: No placement restrictions. Income: $1 for every neighboring free parcel, no matter the owner of the free parcel (with a minimal income of $1). Several ranches may benefit from the same free parcel. Special rules: A ranch adds 1 point to your firepower (+1 revolver). A ranch is considered a house to calculate drugstore, bank and saloon incomes. Setting conditions: The parcel on which the drugstore is built must be reached by a road, and the player must also build a house. Income: $3 per neighboring house and per ranch owned by the player. 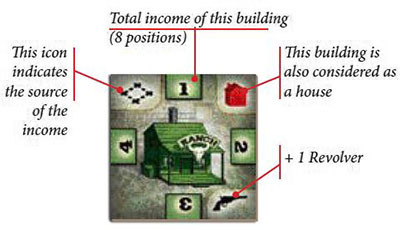 Example: If a player owns a drugstore with a neighboring ranch of his and three neighboring houses, he gets $15 (actually, the ranch is counted twice, the first time as a neighboring house, and the second time as a ranch). Setting conditions: - Income: $3 per neighboring mountain. Several mines may benefit from the same mountain. Once you own a mountain, it no longer benefits other players' mines. Special rules: A mine adds 1 point to your firepower (+1 revolver). Setting conditions: The parcel on which the bank is built must be reached by a road, and the player must also build a house. 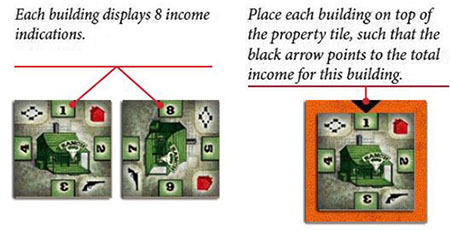 Income: $3 per neighboring house and per mine owned by the player. Example: A player who owns a bank and a mine, with one house and one hotel as a direct neighbor of his bank, receives a bank income of $12. 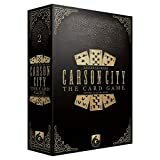 Setting conditions: The parcel on which the saloon is built must be reached by a road, and the player must also build a house. Income: $5 per neighboring house. 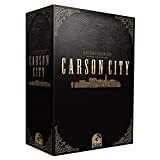 Setting conditions: The parcel on which the hotel is built must be reached by a road, and the player must also build a house. Special rules: A hotel is considered two houses when calculating drugstore, bank, and saloon incomes. Setting conditions: The parcel on which the church is built must be reached by a road, and the player must also build a house. Special rules: A church is considered a house when calculating drugstore, bank, and saloon incomes. A church allows the player to prevent other players' attacks. All buildings of yours directly adjacent to your church cannot be attacked. If you build a church near one of your buildings being attacked, the attack is cancelled. The attacker returns his cowboy to his personal reserve. You are not allowed to attack a church. Setting conditions: The parcel on which the prison is built must be reached by a road, and the player must also build a house. Special rules: The prison adds 2 points to your firepower (+2 revolvers). You are not allowed to attack a prison.